Hi. 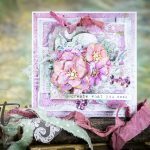 Julia here with my first ever post on the Spellbinders Blog. 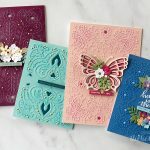 I have been using Spellbinders dies for about 8 years now and Iâm thrilled to be able to share some of my ideas with you. Today, I’m sharing a card made with some of the new dies and an embossing folder by Seth Apter. I’ve gone for quite a clean design as an alternative to creating a mixed media project. Use Splatter Proof Die #2 (the smallest die size is #1) and cut out of blue cardstock three times total, using the Platinum™ machine. Set aside one of the negative pieces, it will be used in Step 6. 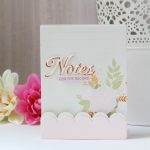 With a piece 4¾ x 6 ¾ white cardstock as our card panel, arrange the die cuts on the top. Cut one of the die cuts in half for interest and adhere with a glue pen. Trim off the excess. Keep any good sized pieces for another project. Emboss with Laser Beams Embossing Folder. Use Robo Bar Die #2 and cut from black cardstock. Nest both dies from Take Flight set, secure with washi tape and cut from black cardstock. Use Take Flight Die #1 and cut from the centre of the negative piece from Step 1. Snip where the ring still joins the negative piece. Use Drip Drop Die #2 and cut from white cardstock. Ink through the FLY disc die cut with blue ink in the centres of three of the Splatter die cuts. But leave the focal one for now. Glue the White Drip Drop die cut with drips facing to the right side. Place the black Take Flight die cut where you would like it to go (don’t secure it yet). Glue the blue ring die cut within it. Now you can position the FLY disc die cut and ink through it with blue ink. Adhere the black FLY disc die cut with 3D Foam Squares. Glue the black Robo Bar die cut as desired. Adhere the black Take Flight die cut using 3D Foam Squares. Using the FLY letters in both black and blue, offsetting them slightly to form a shadow (glue the black letters behind the blue ones) and place within the Robo Bar.  x 7 black cardstock and finally a layer of 6¼ x 8¼ white cardstock. For a smaller card, use fewer mats. I do hope that this project has inspired you. Please leave your comments below.